Hope all of you are enjoying the last week of July! Thanks so much for sending in all of your great photos and datasheets. We’ve had a fun few weeks, training new volunteers and catching up with current COASSTers in Crescent City (CA), Bandon (OR), and Coupeville (WA). This week, we’re starting summer check-ins. If you have any datasheets lying around or if you need any supplies at all, please let us know. We’re always happy to help! 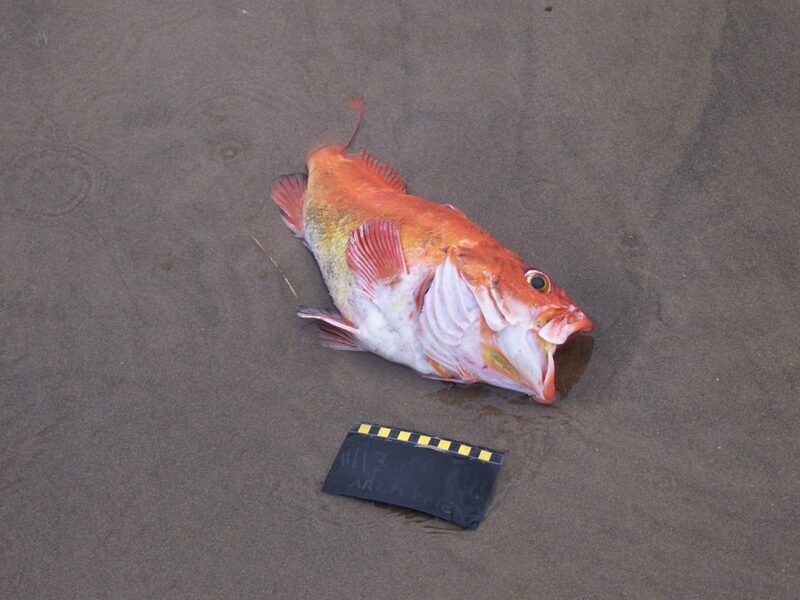 Peter and Helen found this on Haskin Beach on the North Coast of Washington on June 3rd. California COASSTers don’t jump too fast on this one! 3-webbed toe, no hind toe – and from the general size, looks like a juvenile Common Muurre, except that’s not just bright lighting – the foot is pale. Alaska Beached Birds: on AL1, select wc<15cm, move to AL2, select dark bill. Here we’re left with Marbled Murrelet (AL17) of Kittlitz’s Murrelet (AL19) – bill and tarsus are too long for a Kittlitz’s – Marbled Murrelet, that’s correct! 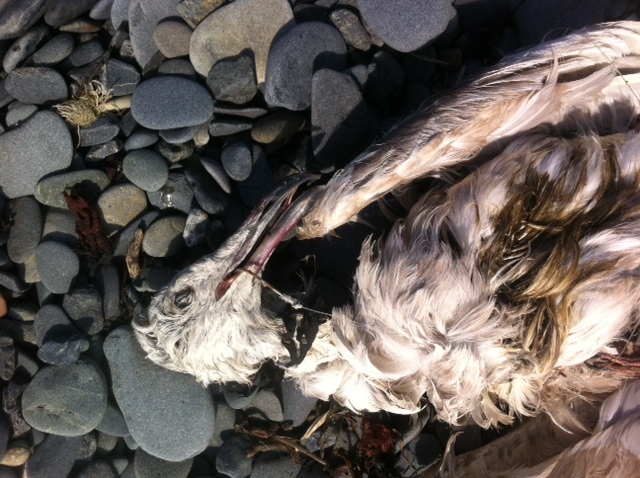 Randy and Jim found this bird on Churchrock Beach on the Chukchi Sea in Alaska on June 21st. 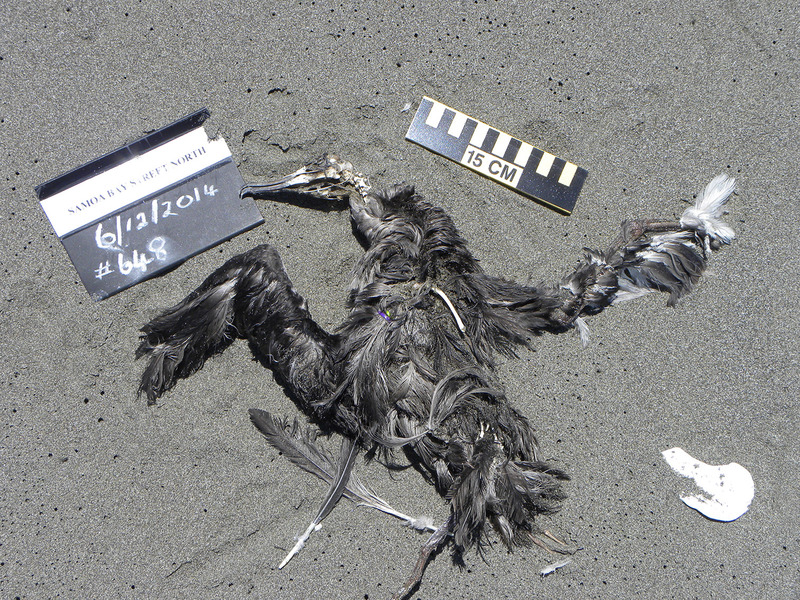 This gull has not “been through the wash too many times” – it’s a species with unique plumage, and rare for West Coast COASSTers (you guys can sit out on this one). 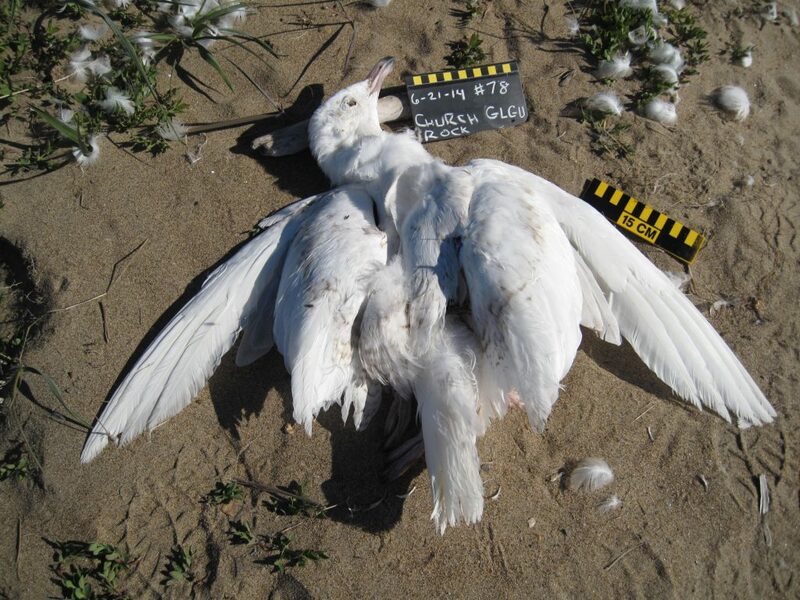 Alaska Beached Birds wing key (‘cause the foot is hidden): Select upperwing white-to-nearly-white, and with a wing chord of 44 cm, we have our match – Glaucous Gull (LA10), a subadult since the bill tip is dark. Candace really pulled out the fine-tooth comb on this bird found on Otter Point in Oregon on July 1st. With just a bill, we’re a little on our own with identification. No worries! We’ve got this! Luckily, don’t have to turn too far to find the first match – dark bill, straight, 50mm. We’re left with Common Murre (wc: AL2, ak: AL3), Pacific Loon (LO2), Red-throated Loon (wc: LO6, ak: LO4), American Crow (wc: PE2) or Common Raven (ak: LB4). Bill depth (perpendicular measurement from upper to lower bill) removes crows and ravens from the running. Between the Common Murre and the two small loons, look at the placement of the nostril – for murres, the nostril is under the “V” of feathers, for the small loons it’s at the point of the “V,” or slightly above. Good work – Common Murre, adult, breeding plumage. 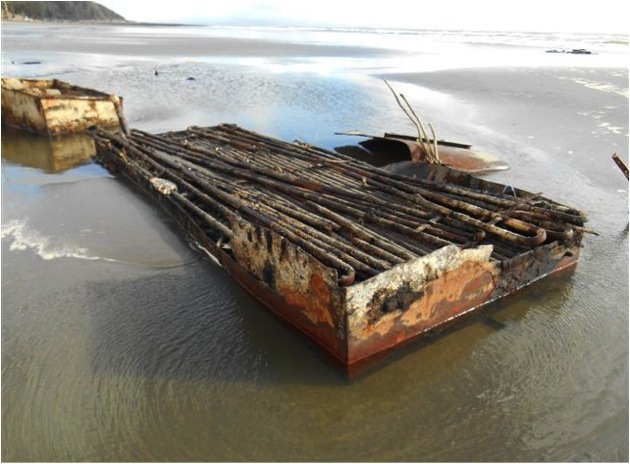 This huge marine debris item was found on March 10th by LoAnne on Washaway Beach. This piece is extremely weathered and multi colored. 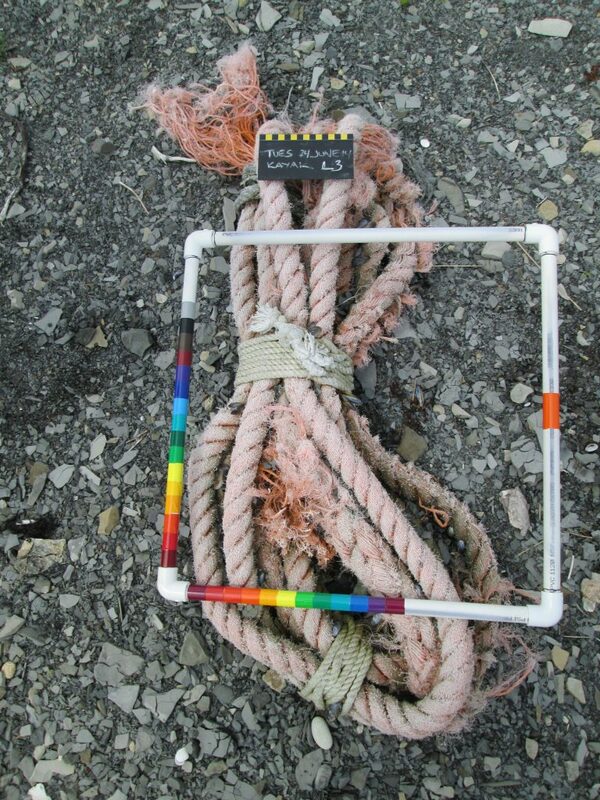 Characteristics like these are clues to how long marine debris had been in the water and where pieces may have come from. On July 19th, Hillary led the interns and students from a marine biology class on a field trip to Ocean Shores. 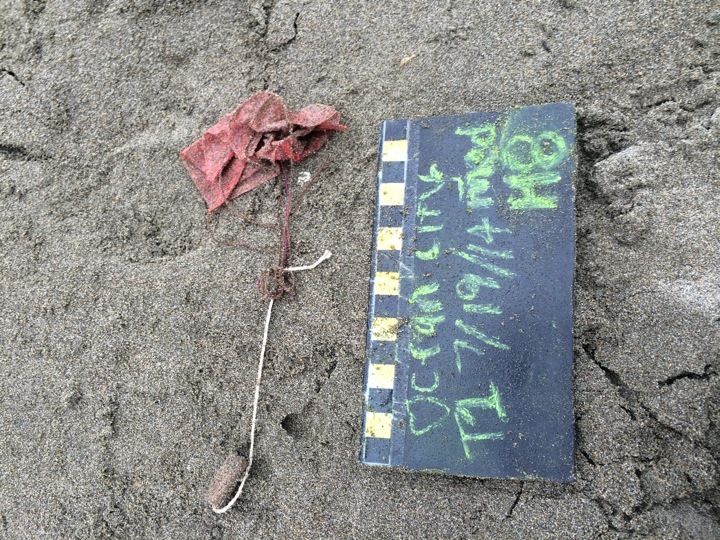 Their marine debris surveys documented plenty of lasting evidence from 4th of July celebrations, including the remnants of this parachute firework. A double whammy for potential harm to wildlife: this object is red which may attract some birds more than other debris, and it has several small loops which pose a risk of entanglement. How cool is this mermaid’s purse?! No, we’re not kidding, this really is called a mermaid purse. 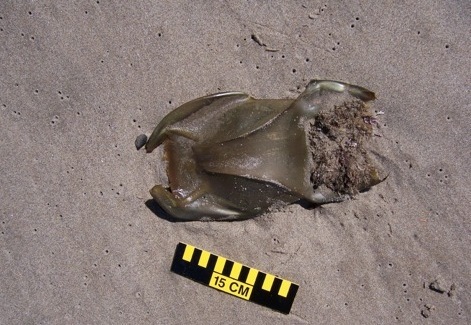 These skate eggs were found by Janice at Oregon Mile Marker 309. Although they sometimes wash ashore, skate eggs belong in the water on the sea floor, where they grow and eventually hatch. The eggs are covered a sack to protect them from predators. Hundreds of skate species have been identified and their egg sacks can be distinguished by size, length, and color. Eggs can range in size but are typically found to be very small, only a few cm in length. 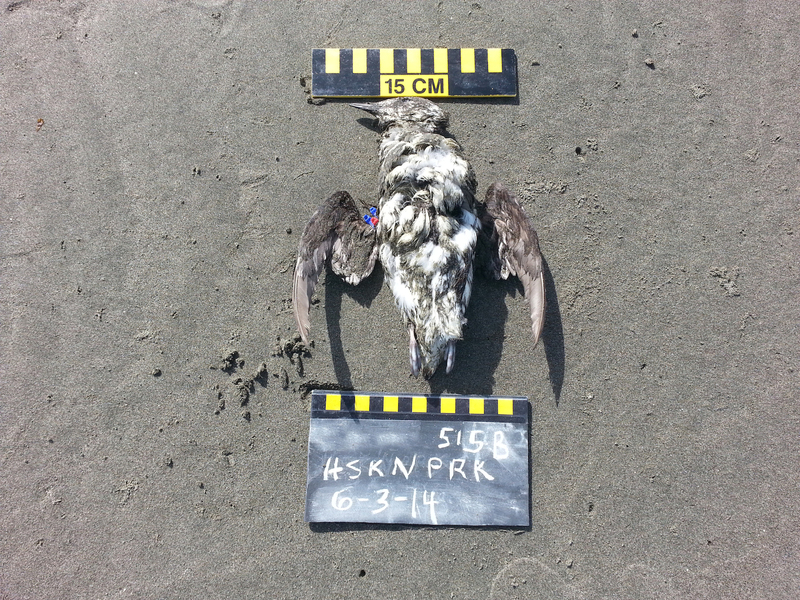 This entry was posted in Uncategorized and tagged Common Murre, Glaucous Gull, Large Marine Debris, Marbled Murrelet, Skate eggs on July 28, 2014 by coasst.